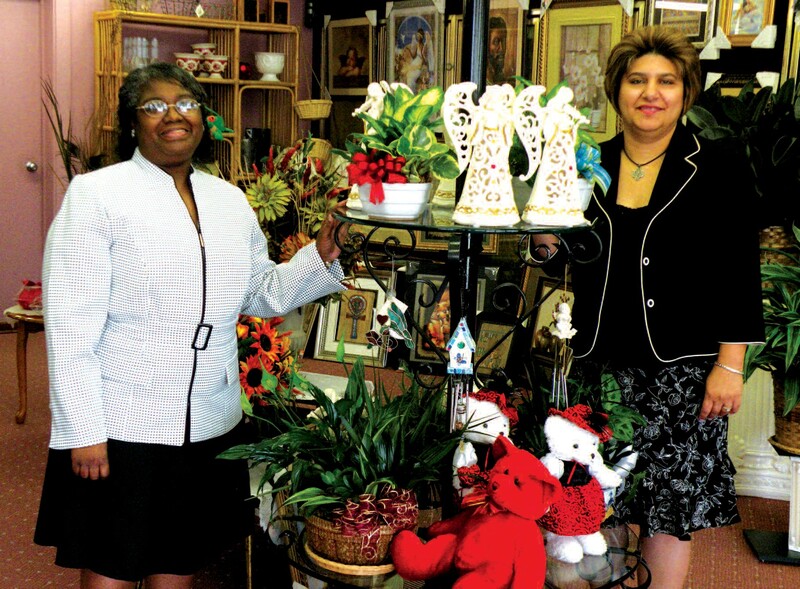 Amira “Amy” Brown, (r) Owner/President, and Alice Ruth pose near a display in Peace of Mind located at 5548 Ogeechee Rd. The best kept secret in headstone monuments, gifts, gift baskets, and much more sits off of Highway 17, and if you are speeding you just might miss it! Located at 5548 Ogeechee Road, Peace of Mind offers the very best in personal gifts to commemorate birthdays, holidays, anniversaries and all of the other important events that occur in our lives. Owner and President Amira Brown gets great joy out of what she does. “Amy” as she is better known, enjoys making sure her customers are well taken care of. Brown and Alice Ruth maintain the day to day operations of the shop, and the dynamic duo are the epitome of southern hospitality. Brown, originally from Egypt, began her career with monuments and bronze nearly thirteen years ago with a company called SCI. Her positon with the company brought her to Savannah. Shortly thereafter, the Savannah branches were sold, and Brown decided to resign. She didn’t leave alone, though. Upon hearing of her resignation, Ruth resigned as well! Amy opened Peace of Mind five years ago, with Alice by her side. The business started out as just a headstone monument and gift shop, and has gone on to include odds and ends, beautiful gifts, as well as floral arrangements. The discovery of her floral talents has lead her to produce arrangements for weddings, funerals and other special occasions. Her work with bronze and monuments has lead to her being called on by the City of Savannah to produce a plaque for the city’s new parking garage. “I love what I do”, Brown says when asked what drives her. As she speaks it’s apparent that she genuinely cares about her customers. “I have no regrets about anything. I love what I do, and I feel for people. I love seeing the satisfaction in their eyes”. So the next time your special occasion requires flowers, or you need a monument or bronze to properly memorialize a love one, stop on by Peace of Mind. Amy and Alice are willing and waiting to serve you and satisfy your needs.